Charlie Crist Says He Is Willing To Alienate Broward Democrats. Well, that didn’t last long. Greasy Charlie Crist recently opened a headquarters in Broward County, the largest democratic county in the state of Florida. He opened it to lots of fan-fare, and what some describe as paid-for attendees. Mitch Ceasar was there. Steve Geller was there. Charlie Crist heaped lots, and lots of praise on Broward County. He declared that together they would win. Did you get that? Charlie Crist doesn’t care what the Democratic voters of Broward County want. He doesn’t give one damn whether you vote for him or not. What is more important to Charlie Crist is what Charlie Crist wants. I don’t think it could get any clearer than that. Here we have a candidate for Governor who is so sure of himself, that he gives less than a damn about what his would-be constituents want. He simply doesn’t care. If you don’t vote for him, he doesn’t care about that either. If this man is willing to go on television and say that he doesn’t care about certain voters before he is elected, do you honestly think he will give a rat’s backside about you if/when he does get elected? People need to realize that all that glitters isn’t gold. In fact, Charlie Crist is selling iron pyrite. You know, fool’s gold. As I pointed out in a prior post, Charlie Crist will not debate Nan Rich because he doesn’t want to go on record as being for certain Democratic principles. He doesn’t want to align himself totally with Democrats because he is looking to pick up Independent and Moderate Republicans. Charlie Crist also says to Michael Putney that he has only flip-flopped on a few issues, which means a lot of what he believed in as a Republican, he still believes in. At least that’s what he wants non-democrats to believe. If a politician is willing to tell you that you don’t matter before he is elected, rest assured, you won’t matter once he is in office. Charlie Crist has always pimped himself out to the highest bidder, and if he weasels himself back into the Governor’s Mansion, there will be little difference. There will be more Scott Rothsteins. There will be more selling of judgeships. 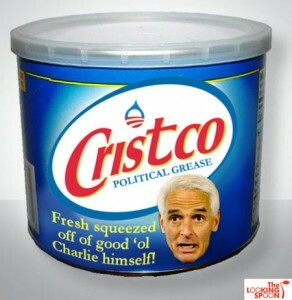 The difference this time is that Crist really WILL be going to the highest bidder, Democrat or Republican. He has nothing to lose. The Florida Constitution says a Governor can only serve 2 four-year terms, consecutive or not. Not that Crist has ever completed an elected term before setting his sights on something else, but he can do whatever he wants for the highest bidder without repercussion. Our constitution doesn’t allow recalls. Crist knows his chances of a higher office are slim to none, so what does he have to lose? The answer is nothing. Crist is licking his chops at the possibilities that would be before him as Governor of Florida. Please do more articles in Nan Rich and what she stands for! The media, for the most part, doesn’t pay much attention to her because she is running a grassroots campaign and can not contribute as much money to them as Crist and Scott! I find it dispicable that this is happening! She has worked much harder than either of the other candidates and Florida has the right to hear from all of the candidates! We have a right to know who is running and what they will do for us! If you don’t give us that oppotunity then you are just feeding into the republican agenda! I’m going to hav Nan on my show again very soon!